I had the privilege of learning with Dr. Lee Meadows recently and I have drafts of several posts that I’ve been wanting to share. This is the first of many. Dr. Meadows is a professor of science education at the University of Alabama-Birmingham and is a nationally recognized expert on inquiry-based science education. If you don’t know the story of Dr. Meadows, he actually took a sabbatical a few years ago and immersed himself back in the classroom as a 9th grade physical science teacher (more about that story HERE). He taught at Spain Park High School and his instructional model is dubbed- The Spain Park Model. The Spain Park Model is an elegantly simple and brilliant way to connect the 5 Essential Features of Classroom Inquiry to the stages of Conceptual Change. Download the Spain Park Model and examine your science instruction practices. Are you intentionally providing students with opportunities to practice the features of classroom inquiry? Are you helping students uncover their initial ideas about key concepts? 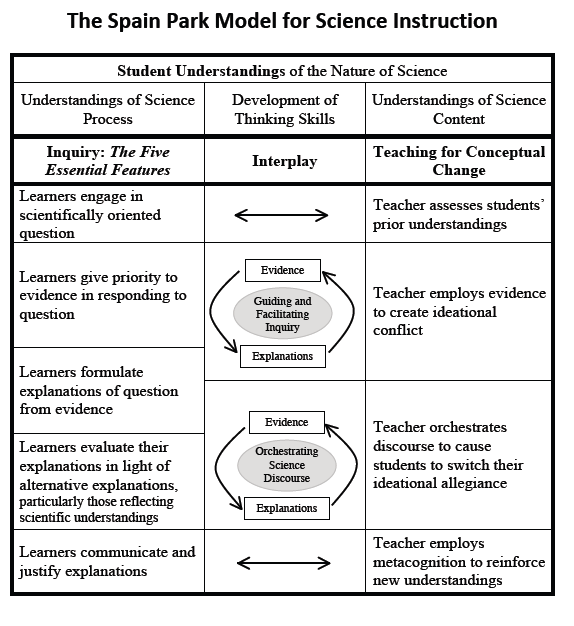 Are you also facilitating students to modify their changing ideas based on evidence? This framework could be useful for a PLC of science educators looking to improve outcomes for students. I’m interested to hear how/if this framework is useful to teachers and those of us who support them.